Antonio Rodolfo Quinn Oaxaca (April 21, 1915 – June 3, 2001), more commonly known as Anthony Quinn, was a Mexican-born American actor, painter and writer. He starred in numerous critically acclaimed and commercially successful films, including La Strada, The Guns of Navarone, Zorba the Greek, Guns for San Sebastian, Lawrence of Arabia, The Message and Lion of the Desert. He won the Academy Award for Best Supporting Actor twice: for Viva Zapata! in 1952 and Lust for Life in 1956. Quinn was born Antonio Rodolfo Quinn Oaxaca on April 21, 1915 in Chihuahua, Mexico during the Mexican Revolution to Manuela (née Oaxaca) and Francisco Quinn, known informally as "Frank" and "Nellie". Francisco Quinn was born in Mexico, to an Irish immigrant father from County Cork and a Mexican mother. 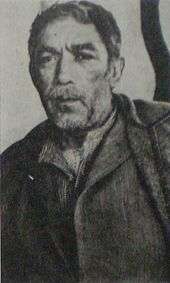 Frank Quinn rode with Mexican revolutionary Pancho Villa, then later moved to the East Los Angeles neighborhood of City Terrace and became an assistant cameraman at a movie studio. In Quinn's autobiography, The Original Sin: A Self-portrait by Anthony Quinn, he denied being the son of an "Irish adventurer" and attributed that tale to Hollywood publicists. Quinn grew up first in El Paso, Texas, and later the Boyle Heights and the Echo Park areas of Los Angeles, California. He attended Hammel Street Elementary School, Belvedere Junior High School, Polytechnic High School and finally Belmont High School in Los Angeles, with future baseball player and General Hospital star John Beradino, but left before graduating. Tucson High School in Arizona, many years later, awarded him an honorary high school diploma. As a young man, Quinn boxed professionally to earn money, then studied art and architecture under Frank Lloyd Wright, at Wright's Arizona residence and his Wisconsin studio, Taliesin. The two men became friends. When Quinn mentioned that he was drawn to acting, Wright encouraged him. Quinn said he had been offered $800 per week by a film studio and didn't know what to do. Wright replied, "Take it, you'll never make that much with me." During a 1999 interview on the show Private Screenings with Robert Osborne, Quinn said the contract was for only $300 per week. After a short time performing on the stage, Quinn launched his film career performing character roles in the 1936 films Parole (in which he made his debut) and The Milky Way. He played "ethnic" villains in Paramount films such as Dangerous to Know (1938) and Road to Morocco, and played a more sympathetic Crazy Horse in They Died with Their Boots On with Errol Flynn. He came back to Hollywood in the early 1950s, specializing in tough roles. He was cast in a series of B-adventures such as Mask of the Avenger (1951). His big break came from playing opposite Marlon Brando in Elia Kazan's Viva Zapata! (1952). Quinn's performance as Zapata's brother won Quinn an Oscar while Brando lost the Oscar for Best Actor to Gary Cooper in High Noon. 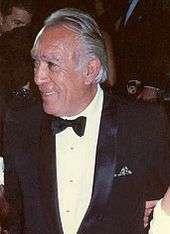 Quinn was the first Mexican-American to win an Academy Award. He appeared in several Italian films starting in 1953, turning in one of his best performances as a dim-witted, thuggish and volatile strongman in Federico Fellini's La strada (1954) opposite Giulietta Masina. Quinn won his second Oscar for Best Supporting Actor for his portrayal of painter Paul Gauguin in Vincente Minnelli's Lust for Life (1956). The following year, he received an Oscar nomination for his part in George Cukor's Wild Is the Wind. He starred in The Savage Innocents 1959 (film) as Inuk, an Eskimo who finds himself caught between two clashing cultures. As the decade ended, Quinn allowed his age to show and began his transformation into a major character actor. His physique filled out, his hair grayed, and his once smooth, swarthy face weathered and became more rugged. He played a Greek resistance fighter in The Guns of Navarone (1961), an aging boxer in Requiem for a Heavyweight, and the Bedouin shaikh Auda abu Tayi in Lawrence of Arabia (both 1962). That year he also played the title role in Barabbas, based on a novel by Pär Lagerkvist. Art critic Donald Kuspit, explains, "examining Quinn's many expressions of creativity together—his art and acting—we can see that he was a creative genius..."
Quinn's first wife was the adopted daughter of Cecil B. DeMille, the actress Katherine DeMille; they wed in 1937. The couple had five children: Christopher (1939–1941), Christina (born December 1, 1941), Catalina (born November 21, 1942), Duncan (born August 4, 1945), and Valentina (born December 26, 1952). Their first child, Christopher, aged two, drowned in the lily pond of next-door neighbor W.C. Fields. In 1965, Quinn and DeMille were divorced, because of his affair with Italian costume designer Jolanda Addolori, whom he married in 1966. They had three children: Francesco Quinn (March 22, 1963 – August 5, 2011), Danny (born April 16, 1964), and Lorenzo Quinn (born May 7, 1966). By the 1990s, Quinn then had two children with his secretary, Katherine Benvin; daughter Antonia Patricia Rose Quinn (born July 23, 1993) and son Ryan Nicholas Quinn (born July 5, 1996). His marriage with Addolori finally ended in divorce in August 1997. He then married Benvin in December 1997. Quinn and Benvin remained married until his death, in June 2001. Quinn spent his last years in Bristol, Rhode Island. He died of respiratory failure, pneumonia and throat cancer in Boston, Massachusetts at the age of 86. In Chihuahua, Mexico, there is a statue of Quinn (who was originally from Chihuahua) doing his famous "Zorba the Greek" dance. A 70-foot high mural, entitled "Anthony Quinn" or more commonly "The Pope of Broadway" (1984) by Eloy Torrez, is at 259 W. Third Street, Los Angeles, California. The National Council of La Raza gives the Anthony Quinn Award for Excellence in Motion Pictures as an ALMA Award. 1 2 3 Gates, Anita (June 4, 2001). "Anthony Quinn Dies at 86; Played Earthy Tough Guys". The New York Times. 1 2 Profile, FilmReference.com; accessed March 7, 2015. ↑ The films of Anthony Quinn. Google Books. Retrieved January 7, 2012. ↑ "Anthony: The Mighty Quinn", bbc.co.uk, June 3, 2001; accessed March 7, 2015. ↑ Stephen M. Silverman. "Macho Actor Anthony Quinn Made Passion His Compass", people.com; accessed March 30, 2015. ↑ Private Screenings with Robert Osborne, Turner Classic Movies cable channel, re-aired April 21, 2009 (originally broadcast 1999). ↑ Golden Globe awards: 1970, imdb.com; accessed March 30, 2015. ↑ "Henry the Second", Time Magazine, April 7, 1961. ↑ Spoto, Donald. Laurence Olivier: A Biography. New York: Harper Collins, pp. 360–68. 1 2 Profile of Anthony Quinn Archived April 3, 2008, at the Wayback Machine., TedStrong.com; accessed March 30, 2015. ↑ Transcript: "Remembering Anthony Quinn", Larry King Live, June 4, 2001; accessed May 12, 2008. ↑ Exhibitions: Feedback Archived May 11, 2008, at the Wayback Machine., AnthonyQuinn.net; accessed March 30, 2015. 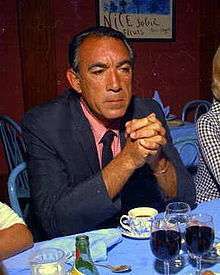 1 2 "Chronology of Anthony Quinn and Related World Events" AnthonyQuinn.com; accessed March 30, 2015. ↑ McFarland, Jodi (May 6, 2008). "Mid-Michigan Hispanic Business Association hosts art reception honoring the late Anthony Quinn". mlive. Retrieved August 7, 2011. ↑ "Tips: Things to do in Chihuahua, Mexico". Members.virtualtourist.com. Retrieved January 7, 2012. ↑ Los Angeles County Anthony Quinn Public Library, colapublib.org; accessed March 30, 2015. ↑ Anthony Quinn Bay and Beach, WorldBeachList.com; accessed March 30, 2015. ↑ Quinn's widow adopts legal battle, contactmusic.com; accessed March 30, 2015.